There comes a time in life when birthdays just aren’t what they once were. Gone are the days of inviting your buddies over for cake, ice cream and party games. No more slumber parties. No more gathering your besties for a night out on the town. Depressing, right?! We say, enough! Who cares if you’re turning 32. Or 46. Or 73. Let’s celebrate it! We all have that friend who is selfless. They always say yes. Always help others. Always comes to the rescue when you’re double-booked and your children are stranded at their after-school practice without a ride in sight (not that this has ever happened to any of us…). There’s one fabulous way to recognize that friend and make them feel incredibly loved and appreciated. Throw them a surprise birthday party! 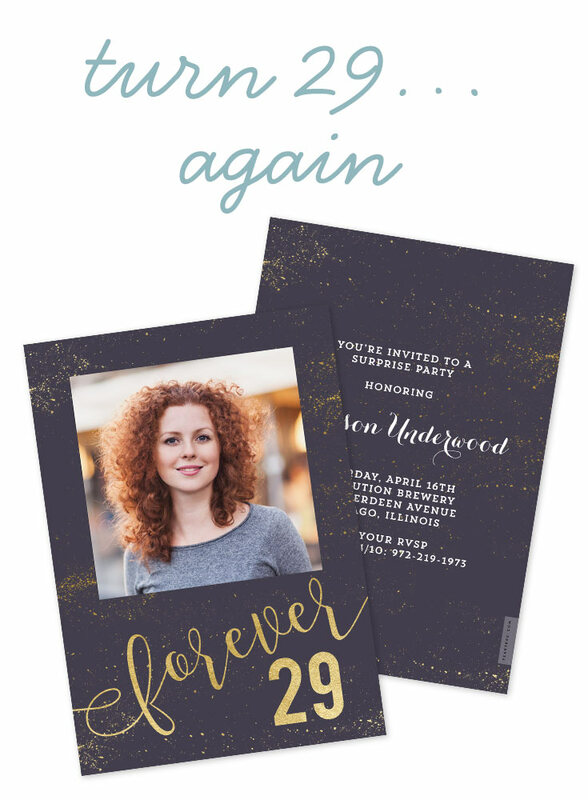 We love this new surprise party invitation featuring a photo of the guest of honor. Change the colors to fit your vision, update the text and it’ll be printed zipped out to you in no time flat. We promise we’re pro-aging. We embrace our wrinkles, gray hair and our mom-bods. However…this invitation is Just. Too. Fun. We all have that girlfriend who declares that she’s turning 29 this year for like, the twelfth time. Throw her a party and invite in style that’ll bring a smile to each guests’ face the moment they open the invitation. Choose a photo, switch up the colors, fonts and text until its perfect for your friend who will forever be 29. Do you have someone in your life with a milestone birthday approaching? Whether they’re turning 30 or 90, honor them with a birthday party that brings together those who love them most. 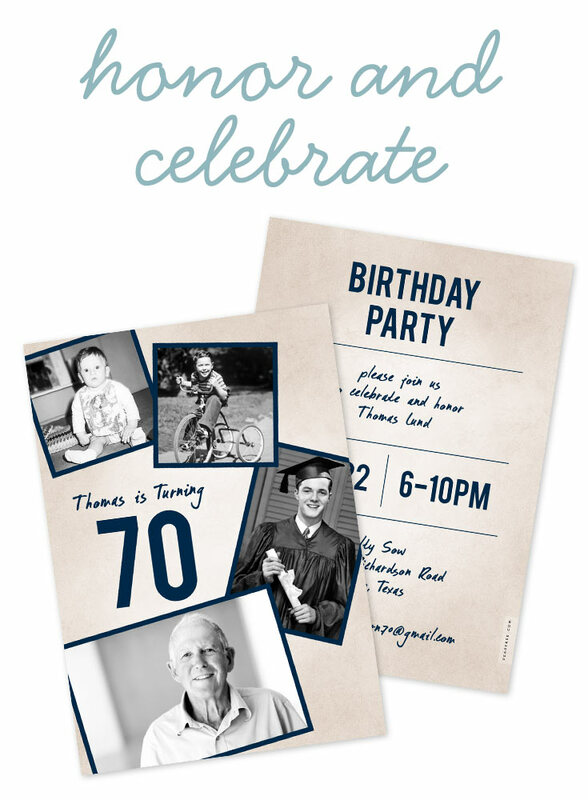 We adore this new birthday party invitation that lets you invite and show off the birthday guy or gal through the years. Personalize the look with any color, font and text for a design that’s as one-of-a-kind as the guest of honor. When those milestone birthdays approach, it’s natural to have “OMG” moments. As in, “OMG, there’s no way I’m turning 40 because I swear I just graduated from high school last year”. We know the feeling all too well. Take a moment to accept it and then, OWN IT. Throw yourself a bash and invite in your own signature style. 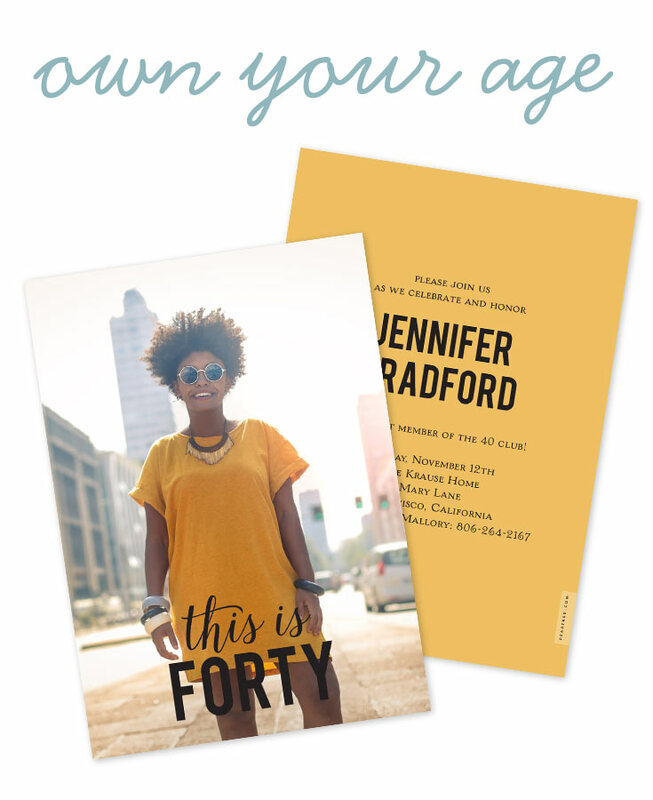 This new adult birthday party invitation features the phrase “This Is Forty” (or whatever age you’re about to embrace) over the top of your photo. It’s also available in a horizontal format. You can even update the background on the backside to designs like elegant marble or farmhouse wood grain. The options are endless and the result is marvelous!